It’s one thing to ensure that the wedding is everything the bride-to-be could have ever wanted, but it’s another to try and keep her mind occupied and stress free. If you’re lucky enough to have to cater to the bride the night (or nights) prior to the big event, than you already know what levels of stress are in store for you. You will need to be in charge of ensuring the bride is able to relax and have a good time, especially during her one-and-only bachelorette party. You were wise enough to choose Las Vegas as your destination for the bride’s bachelorette party, but will you know exactly where to stay? Hotel’s on and off the Las Vegas Strip offer a variety of bachelorette suite rates, and while it may seem best to try and keep the budget as low as possible, staying at some third-rate motel where crackheads are bound to do their business is just simply not an option. 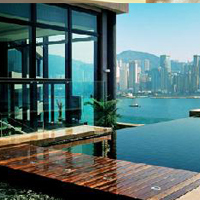 Chances are you’ll have a group of girls to have to worry about housing for the duration of the event which leaves you the option of either booking a string of rooms or going for the coup de grace and springing for a large, luxury suite. Much larger than your average King Suite and far more lavished than the hotel’s basic room setup, a luxury suite is typically a multi-room space that not only gives you plenty of room to party in, but may also come with some extra perks like a private pool or 24-hour butler service. 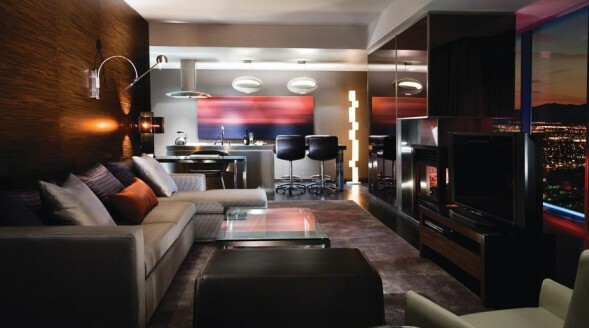 Along the stretch of Las Vegas Boulevard’s assortment of luxury locations, you’re bound to find that just about each hotel has its own extravagant suite perfect for this tantalizing weekend. Though the prices may be a bit up there, this is the bride you’re being cheap on; your best friend. If need be, you can canvas the group traveling for the party to chip in as most of them will probably be staying in the suite as well. 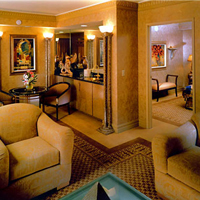 One of Las Vegas’ most sought after suites can be found at the MGM Grand hotel and resort. Popular for its most unrivaled view of the Las Vegas Strip, MGM’s Skyloft offers two stories of luxurious living, complete with floor-to-ceiling glass panels, a separate living room, and the comfort of knowing you’re as far from any other guests as possible. “Dream butlers” will be at the bride’s beckoning call, going so far as to draw the ladies bath at the close of the evening. The expansive view of the city will not only make the bride-to-be feel like a VIP, but she’ll also get the feeling that her party is the MGM’s top priority and the cream of the crop of the city. Though there isn’t much that can beat the elegance of MGM’s Skyloft, Caesar’s Palace comes pretty close. Adorned with a two-story dance floor, the Absolut Penthouse Suite is a four-bedroom fantasy that is bound to make any of its guests blush. Feeling like a sleep-in lounge, the Absolut suite is broken up into six different areas, each of which housing a decor inspired by one of Absolut’s flavors. A bi-level lounge and a second floor oasis give guests the perfect opportunity to relax and drink in each absolutely perfect rooms. The Palms is well aware of the need to party during a bachelorette party, and it shows its understanding with the Crib Suite. Designed to house a regulation-sized pool table and private DJ booth, the Crib Suite is everything that’s required for an in-house bachelorette party. A hydraulic bed, while a cool touch to the room, should find no use during this celebration of the bride’s last night as a single girl. Coming in at approximately 2,000 square feet, the Palms suite can fit up to 65 partying individuals, whom will all surely flock to the in-room wet bar. For a look at Las Vegas’ elegant side, you could look to putting the bachelorette up in the Presidential Suite at the Palazzo. Decorated in an assortment of lighter toned marble, this Vegas bachelorette suite will offer the perfect spot for a lower key party. Absent is the private DJ booth and rooftop pool, but the expansive suite is a comfortable stopping point when the night starts to wind down. Coming in at over 6,000 square feet, this suite offers up to four bedrooms with a separate media room, living room, dining room, and wet bar. 24-hour butler service will ensure the girls in your party won’t have to lift a finger the entire evening. 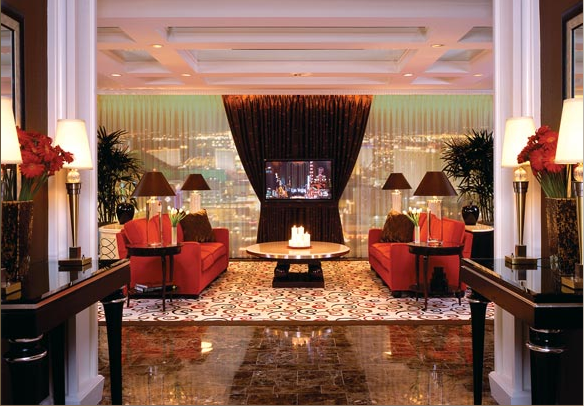 To give your bachelorette that rock star experience, you can look to the Venetian’s Chairman Suite. Equipped with amenities that make for the perfect bachelorette party experience, the Chairman Suite media area can fit up to 10 individuals, ensuring that the party won’t get too large. Taking on the look and feel of a media room during the day, as night falls the room transforms into a private karaoke lounge. Three separate fireplaces give the room a comforting feel when the evening winds down to a close. Private butler services and a private entrance will make the lady of the hour feel like the ultimate VIP guest in Sin City. If you’re looking for the best method to keep the bride-to-be stress free, than at least one night in a Las Vegas suite is a necessity. With so many to choose from, there is no feasible way that there isn’t a suite catered specifically for the bachelorette. For the best prices in Sin City, be sure to get in contact with the crew at Bachelorette Vegas and book this room as soon as possible. The rooms may be pricey, but people are quick to jump on them.